Up at 4.45am and head straight to T5 where we encounter a long queue for bag drop. It appears everyone else did on line check in yesterday. We are fast running out of time for a decent breakfast due to the queue so decide on a Starbucks where I have the stalest almond croissant I have ever encountered and Kev waits an absolute age for a toasted panini. Lesson learned no matter how much of a hurry we are in we will not be frequenting this establishment again. Take off at 7.30am on the BA flight to Rome. Have a cheese and ham croissant, juice, tea and coffee  and at 10.30am we are landing at Fiumicino airport. 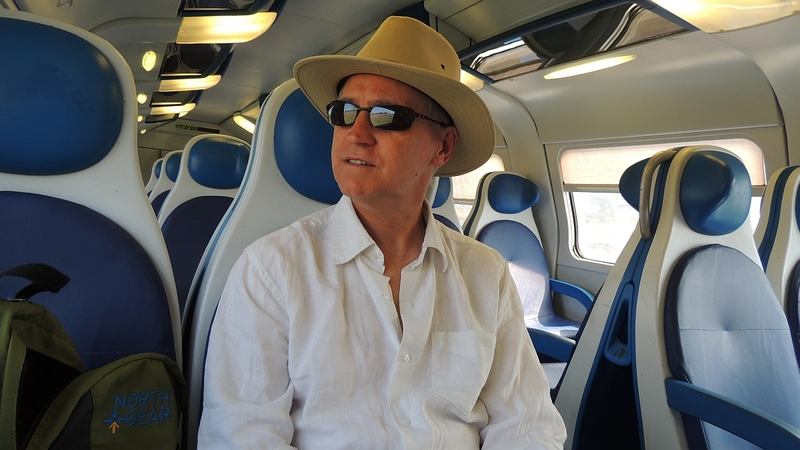 We head to the station where we buy a ticket from the self service machine to Trastevere  then having read online we know we need to verify the ticket on the platform near the waiting train. We catch the 11.28am train and it takes just 26 minutes to arrive in Trastevere. 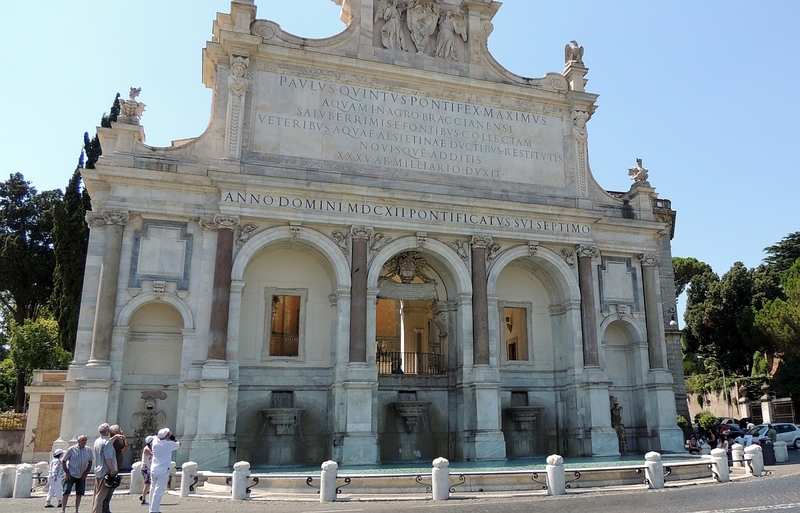 We head on out the station and drag our cases in the hot sunshine up the road to our hotel The Trilussa Palace. The room (214) isnt ready yet so we leave our luggage with reception and they put our passports and money in their safe whilst armed with a map and guidebook we set off to cram in as much sightseeing as we can. 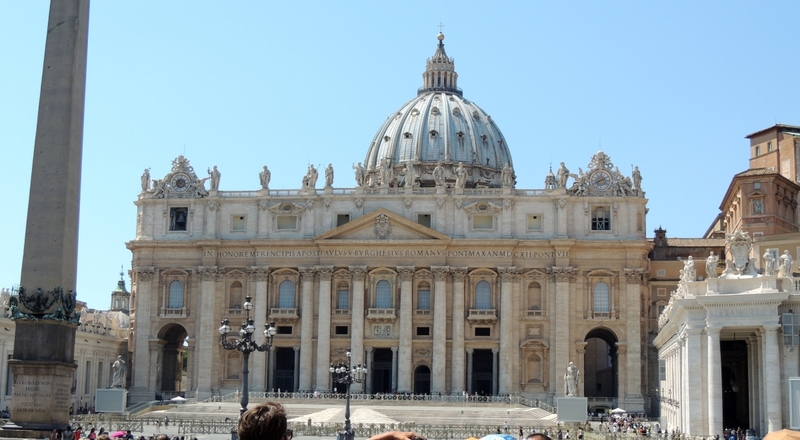 Having visited Rome during a cruise in 2008  we did the main sites in the city then but didnt get a chance to visit the Vatican and St. Peters etc. Therefore the plan is to walk there taking in the various view points of the city on the way. Kev had researched a route which encompassed some wonderful places to stop and admire the amazing city of Rome spread out below us. 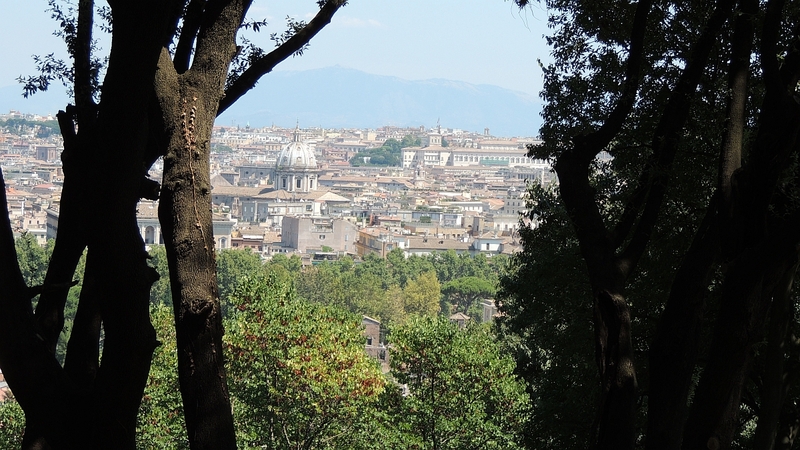 Obviously the fact that we are looking down on Rome means that our walk involves much walking uphill and climbing steps but we are rewarded with some lovely panoramic views. 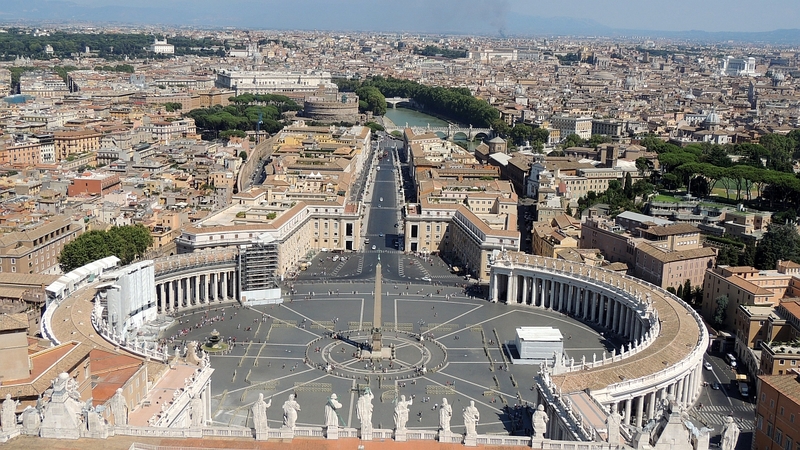 We travel up the Via Giuseppe Garibaldi until we arrive in front of St. Peters Basilica where we join the end of the long and winding queue. For some unknown reason we managed to have joined in the middle of a rather large Japanese tour group and our hearts fall when the guide says that in his experience a queue this long will take 2  3 hours but dont worry we will be in within 3 hours. We look at each other and are just about to re-think our plans as the sun is beating down relentlessly, when he laughs and says only joking  the queue is hugely deceptive and it will only take 20  30 minutes. 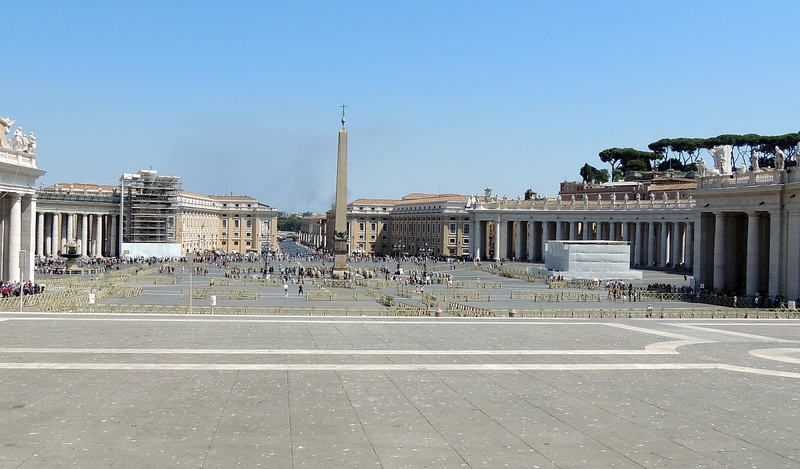 Sure enough within that time we are through the security scanner and ready to enter the Basilica. One other thing worth noting is that women must have their shoulders covered and men must have shorts below the knee. We had come prepared and I cover my shoulders with a shawl before entering. 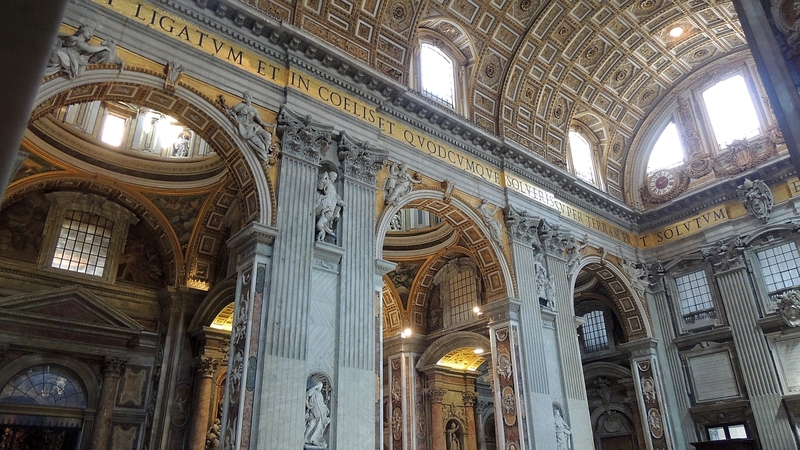 Entrance to the Basilica is free and it really is very impressive  beautiful paintings adorn the ceilings and there is an abundance of gilt and candles. With the sun shining through the beautiful stained glass windows it really is an ethereal sight. 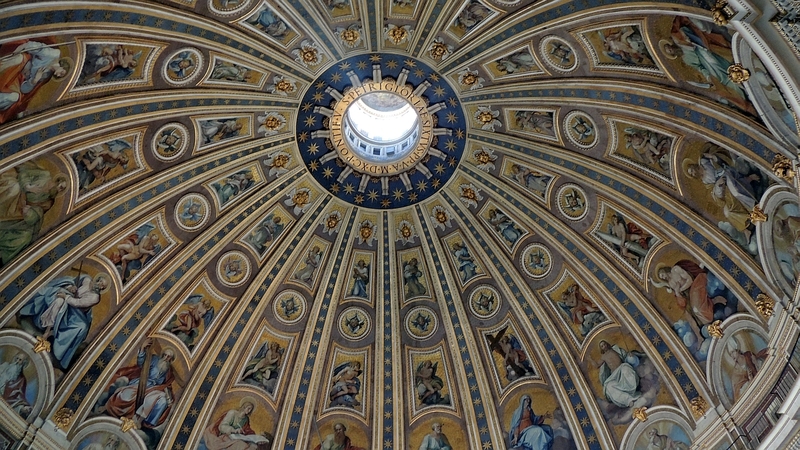 After taking numerous photographs and reading about many of the items and parts of the Basilica we decide to try and find the entrance to the Cupola as we have read that the views from the top make the climb more than worthwhile. We ask one of the guides and he advises us to exit and go to the left (right as you look at it from the front). Sure enough we find the entrance with an option of either paying 5 to walk to the top climbing 551 steps or for 7 you can take a lift half way up and only have to climb 320 steps. Well considering ourselves fit and foolish we go for the 5 option which in the stifling heat was possibly not the best decision as the first lot of steps dont give you anything of consequence to look at. Round and round we go  until we find ourselves inside the giant Cupola looking down at the visitors inside  from up here you can admire the painted ceiling frescos and mosaics far better and the attention to detail is breathtaking. Re-joining the stairs we continue climbing to the outside balcony of the dome  the views of St Marks square and the beautiful manicured gardens are wonderful from up here and we stop to catch our breath and take some photographs and video. But we are still not finished, you can actually reach the top of the Cupola but this involves a tiny staircase which winds round on itself like a helter-skelter. There are several crying children by this point  tired and exhausted and scared of the steep narrow steps. We brush them aside and haul ourselves up to take in the view from the top  it is very crowded up here but the views make the hot climb more than worthwhile and I would seriously recommend making the effort if ever you get the chance. Thankfully there is another set of stairs to exit as you really couldnt fit more than one person on the stairs in some areas and considering the space restrictions it is very well organised. Half way down we go outside to an area where there is a café  here we purchase a much needed glass of water  having exhausted our own supplies earlier as the temperature inside the stairways was stifling. 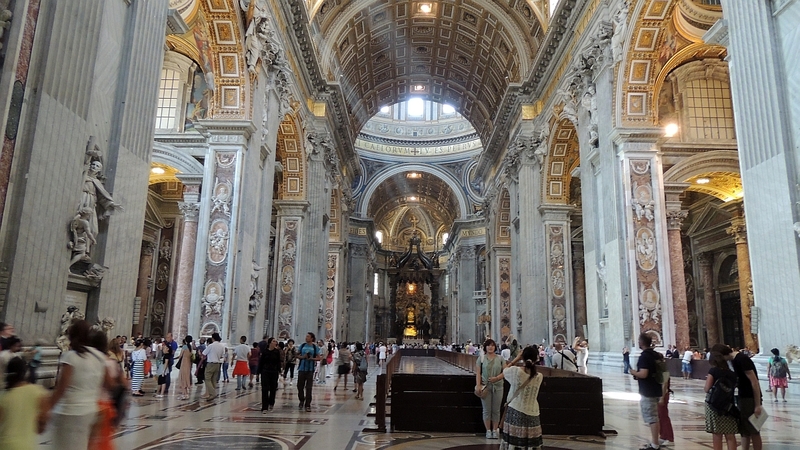 We had read that if it is a particularly busy day it is best to do the Cupola before the Basilica. We head off in the direction of Piazza Navona, but on the way we stop for an enormous gelato in a chocolate waffle cone 4 each  Kev has a chocolate one and I have a cherry one. This proves to be very messy as the sun is melting it quicker than we could eat it. 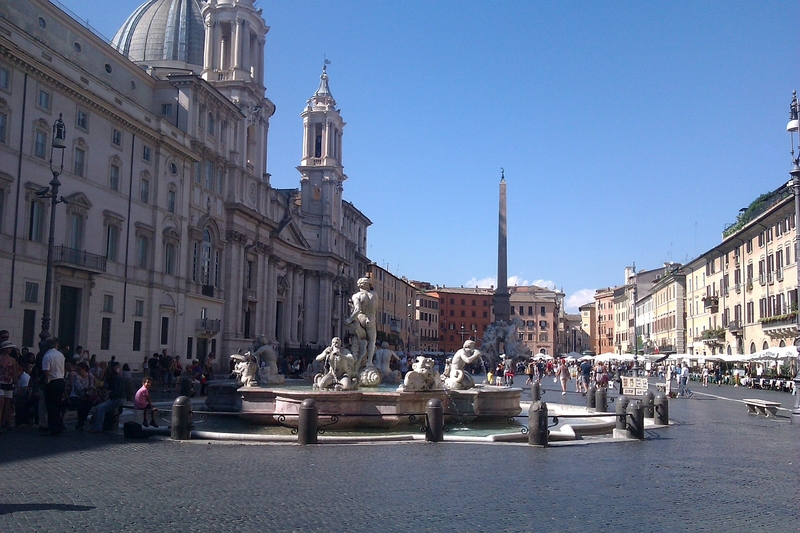 Piazza Navona reminds us of some of the piazzas in Madrid with fountains, music playing and throngs of people enjoying the sights in the beautiful Italian sunshine. 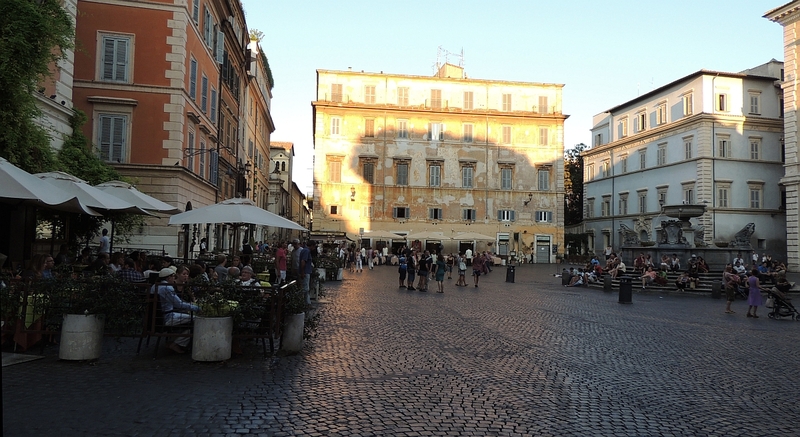 By now we feel we have been out long enough and have seen everything we had hoped to, so a slow walk back to the Trastevere area is in order. Although our room is now ready we notice whilst getting ready that the air conditioning unit is dripping water all over the floor. We tell the reception staff and are assured it will be looked at. 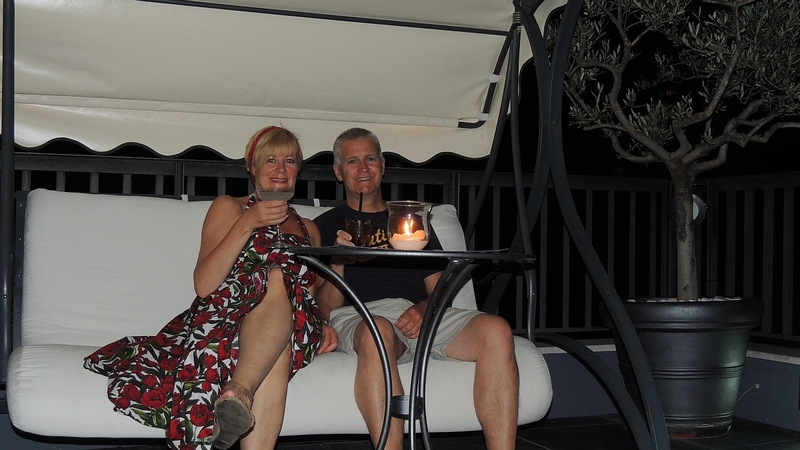 We head up to the roof terrace where there is a bar. 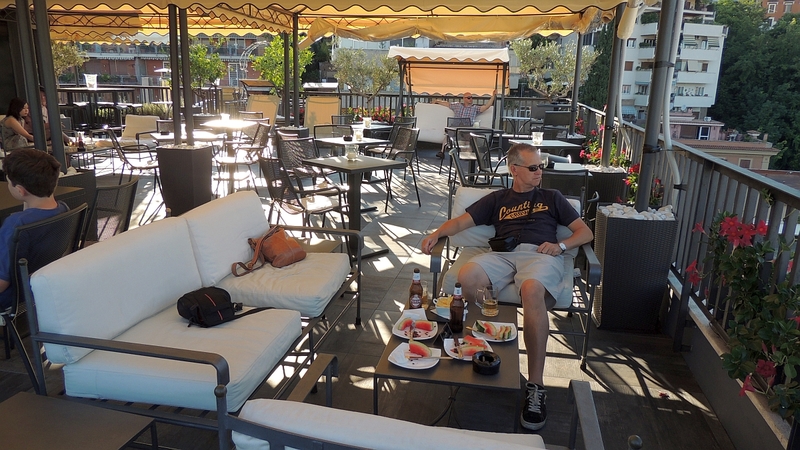 One of the reasons we chose this hotel was the area of Rome it is in and also the roof bar with wonderful views. It doesnt disappoint and we sit and enjoy a drink It is just a shame that so many wonderful cities are blighted by some truly horrible 1970s architecture  in this instance a block of flats adjacent. We enjoy 2 chilled beers which come to 10. 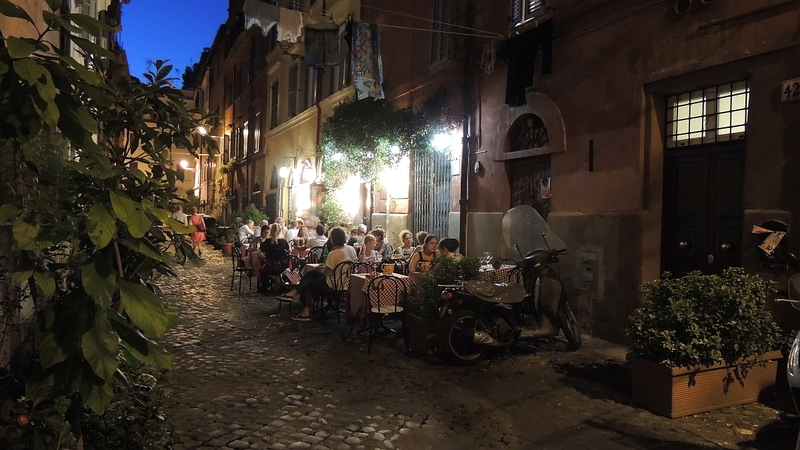 By now we are more than ready for food  we had researched various restaurant options and had a shortlist highlighted on our map  after viewing them we decide to eat at La Botticelli  set in a side street, with walls dripping with bougainvillea and red and white checked cloths on the tables perfect. As darkness falls the lights come on and makes the setting even more picturesque. The only funny thing is there is some washing strewn between the houses on either side of the street and it is dripping onto some of the seats. Kev has a beer and we share a carafe of house red. We enjoy the bread, olive oil and balsamic vinegar while perusing the menu. Finally we decide on courgette flowers stuffed with mozzarella, anchovies which are deep fried. We get 4 flowers and that is ample as a starter. Then we split a spaghetti in tomato sauce with bacon and cheese and the special of veal ravioli with a creamy mushroom sauce. The plate of spaghetti is huge and although I try Kevs and it is just my sort of thing  the gelato from earlier has somewhat suppressed my appetite so I make a tiny dent in my plate of spaghetti whilst Kev manages to finish the ravioli. 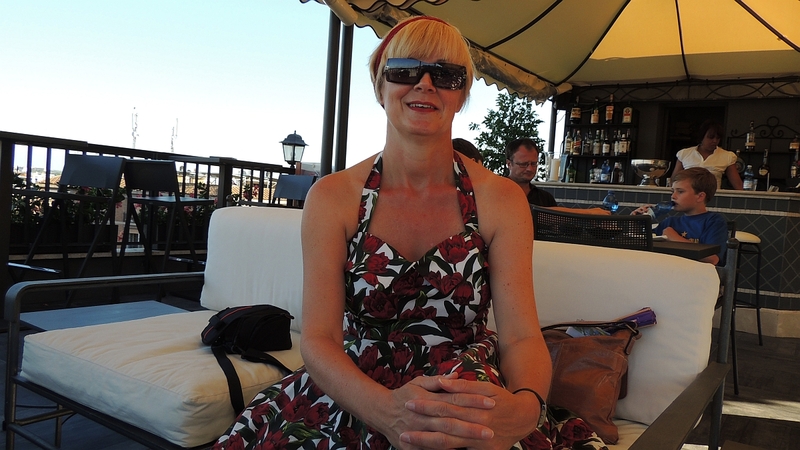 The total bill is 58 and we leave 10 tip as the service and food was wonderful in such a picturesque setting. 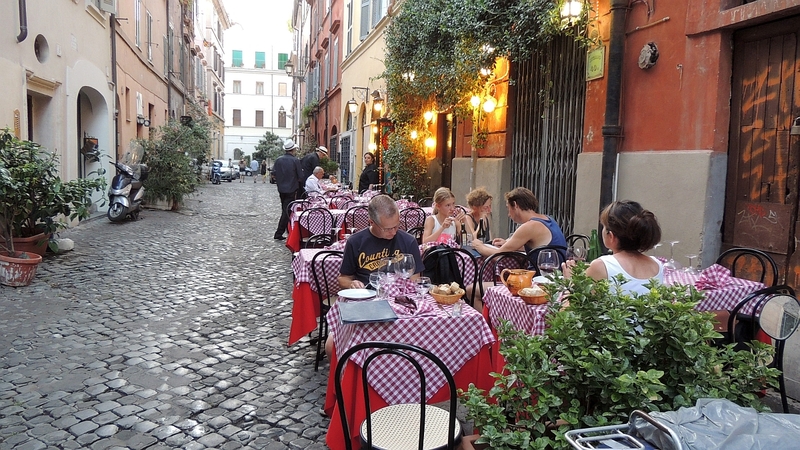 We wander back through the streets, passing pavement cafes and streets bustling with people. The moon is nearly full and it was a good way to walk off all our food however our feet are definitely beginning to ache after all that walking earlier. In the room whilst someone has been in the air conditioning unit is still warm and dripping on the floor so we go to reception  where they give us a bigger room  410. We ask if we can leave our luggage etc., in the old room as it is really too late to pack it up and move it just for a few hours and they agree that is fine. Room sorted we go up to the roof terrace, sit on a swing hammock and enjoy some cocktails  Long Island Iced Tea for Kev and a Margarita for myself  not the best cocktails and at 10 each we wont be having a second. 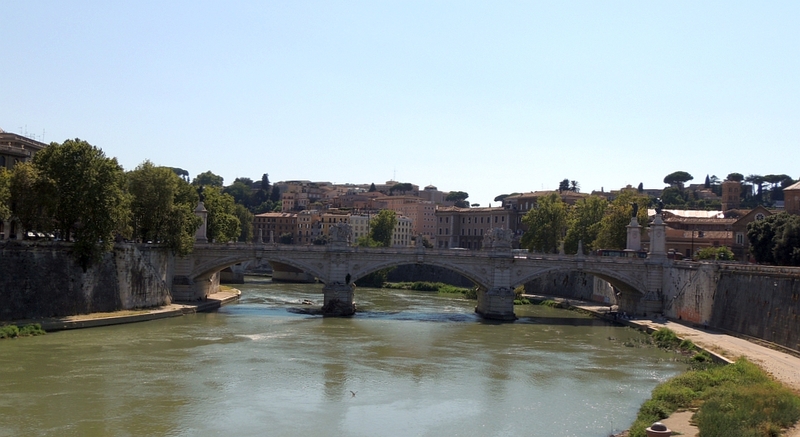 It really is a lovely setting up here though looking over the skyline of Rome and at such a pleasant temperature. Off to bed as we're up early tomorrow to head to the cruise port.